Bat Yam (Ebreu: בַּת יָם‬ (audio) (help·info)) is a ceety locatit on Israel's Mediterranean Sea coast, on the central coastal strip, juist sooth o Tel Aviv. Pairt o the Gush Dan metropolitan aurie, in the Tel Aviv Destrict, the ceety haed a population o 128,892 in 2015. Bat Yam wis establisht in 1926 as Bayit VaGan (Ebreu: בית וגן‬; Hoose an Garden), an wis geared toward Orthodox Jews. Durin the 1929 Palestine riots, Bayit VaGan came unner attacks bi Arab gangs frae neighbourin Jaffa an wis evacuatit bi Breetish Authorities afore bein reestablisht in 1930. In 1936 the toun wis gien the status o local cooncil, an in 1938, the name o the toun wis chyngit tae Bat Yam. Bi 1945 the population haed grown tae 2000 Jews. Follaein the Unitit Naitions vote in favour o a pairtition plan on 29 November 1947 an the subsequent ootbreak o violence, Bat Yam came unner hivy attack frae Jaffa, till Jaffa surrendered on 13 Mey 1948. In the years follaein Israel's unthirldom, Bat Yam grew dramatically due tae mass immigration, gainin the status o a ceety in 1958. A sma Hasidic enclave o Bobover Hasidim, kent as Kiryat Bobov, wis established in 1959. Efter this pynt, housomeivver, Bat Yam began tae suffer frae an Israeli version o "white flicht". As mair an mair immigrants moved tae the ceety, socio-economic problems began tae appear. Relatively law real estate prices an a biggin boom durin the 1970s an 1980s, saw even mair migrants frae lawer socio-economic strata, mainly seicont- an third generation descendants o Jewish immigrants frae Arab kintras muive intae the ceety. As a result, middle-class veteran indwallers o Bat Yam stairtit tae muive oot, primarily tae the newer suburbs o Rishon LeZion, a boomtoun sooth o Bat Yam. The ceety gained a sizeable community o Jews frae Turkey (est. 23% o the population) an haes therefore hostit visits frae the Turkish preses, Süleyman Demirel, an prime meenister, Tansu Çiller. Bat Yam skyline at nicht. Bat Yam ance again experienced a period o rapid growthe early 1990s wi the mass-immigration frae the umwhile Soviet Union leadin tae mony choosin Bat Yam as thair new hame due tae its proximity tae the industrial centres o the kintra, an relatively law real estate prices. The influx o Roushies an Georgians, housomeivver, did nothin tae help the ceety's socio-economic crisis, an bi the early 2000s, follaein financial scandals resultin frae the declinin local leadership led bi Yehoshua Saguy, the ceety wis placed at the brink o bankruptcy. In 2003 a new mayor, Shlomo Lahiani, wis electit an the ceety began tae rejuvenate, wi some auries haein awready been transformed. While some pairts o the ceety which still suffer frae the issues which plagued the whole o this ceety juist a few years ago, Bat Yam oweraw haes stairtit tae lose its image o the "poor suburb", thanks tae lairge investments in eddication, cultur an the appearance o the ceety. In 2008 the Bat-Yam Internaitional Biennale o Landscape Urbanism, which is devotit tae re-examinin urban spaces throu airt an airchitectur, wis held for the first time. In 2010 the seicont Biennale, "Timing" teuk place, which featurt site-specific installations frae designers an architects frae aroond the warld. "Kanyon Bat Yam" - 3 story shoppin mall. Ane o the first malls in Israel which wis opened in 1993. It includes 150 shops on size o 23,000 square meters. In the mall ye can an aa fynd a cinema, restaurants zone, banks, pairkin lot an fitness club. "Kanyon Bat Yamon" - 4 story, includes pairkin lot. "Gan Ha'Ir" - The lairgest pairk in the ceety. Bat Yam cultural centre wi 570 seats concert hall. The location o Bat Yam on the Mediterranean maks it popular wi beach-goers. Bat Yam haes 3.2 kilometers lang promenade alang the ocean wi a lot o pubs an restaurants an sax beaches, ane o which is protectit bi a 300 meter diameter breakwater. Thare are an aa 3 big hotels an anither ane is unner construction. Furthermore the ceety haes several museums, includin the MOBY, the Museum o Bat Yam, which haulds contemporary, cuttin-edge airt installations, the Bat Yam City Museum "Ben Ari", the Museum "Ryback" wi a collection o paintins o the painter, Issachar Ber Ryback. Thare is an' a' a museum in the memory o the Yiddish writer Sholem Asch who lived his last years in Bat Yam, an a smaw Holocaust museum. Bat Yam is served bi bus anerlie. Bein an integral pairt o the Gush Dan metropolitan aurie, Bat Yam haes nae bus lines leemitit tae the ceety borders. Aw bus lines in Bat Yam hae at least ane terminus in Tel Aviv, Rishon LeZion or Holon. Dan is the biggest bus company in the aurie. It operates frequent service tae various neighborhuids o Tel Aviv, an an' a' connects Bat Yam tae Holon, Rishon LeZion, Ramat Gan, Giv'atayim, Bnei Brak, Tel HaShomer an Bar Ilan University. 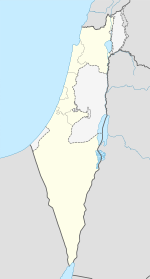 Egged connects Bat Yam tae various neighborhuids o Holon an Rishon LeZion, an an' a' operates service tae Jerusalem, Tel Aviv, Ramla, Ben Gurion Internaitional Airport (pairt-time service) an intermediate communities. In the sooth o the ceety thare is a big bus terminal o "Dan" company. Thare are an aa several Taxi stations aroond the ceety. The Bat Yam-Yoseftal Railway Station wis opened in 2011 as pairt o the new Tel Aviv – Rishon LeZion Wast line. Bat Yam will an aa be the terminus for the reid line o the Tel Aviv Licht Rail. The ceety's major fitbaa club, Maccabi Ironi Bat Yam, currently play in Liga Leumit, the third level o Israeli fitbaa. The club wis formed bi a 2004 merger o Hapoel Bat Yam (which haed spent several saisons in the seicont diveesion in the 1990s) an Maccabi Bat Yam. Bat Yam´s Al Gal beach is regardit tae be ane o the best surfin spots in the region, haein fairly consistent surf conditions, especially durin the simmer months. ↑ Government of Palestine, Village Statistics, 1945, p52. Wikimedia Commons haes media relatit tae Bat Yam. This page wis last eeditit on 14 Februar 2018, at 23:54.